Hi, I am here today to post a card for someone special, Jen, who has been diagnosed with Breast cancer and this is a special blog hop to help support her through this battle hoping and praying she is going to be a survivor. Today we take time to honor our friend and fellow crafter Jen Scull. If you are here hopping with us, then I am sure you know Jen is battling breast cancer. She has been fighting this nasty disease since February. On behalf of Jen, we thank you for being here. We ask as you hop along with us, please consider donating at least $1 using the paypal donation button at any stop along the way. Your donation will go directly to Jen. Thank you. To be eligible to win a prize from our sponsors, collect the hidden letters located throughout the hop. Once you spell out the secret phrase, please email Jenn Cochran at partytimetuesdays@hotmail.com. This will get you entered to win one of several fabulous prizes. It was a pleasure visiting your blog. I look forward to visting again. The way the fairy has the sun in her hand is great. AND those papers are so pretty. I love your card. What a fabulous card! I love the colors you choose to work with and the way you situated the images together. Lovely job! I love the soft colors!! Love it! So cheery and beautiful! Such pretty summer colours! 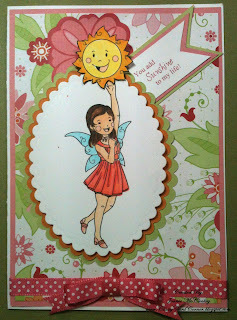 Gorgeous card for Jen! This is stunning! Love the wonderful colors and sunshine! thank you so much for being a part of this blog hop! I'm truly overwhelmed that all of you would take the time out of your busy schedules to not only create such lovely projects, but then participate in something so meaningful for my family. again, thank you! Oh Joanie I love everything about this gorgeous card....the DP you used is awesome! This is beautiful. I love how you added the sun to her outstretched hand. TFS. Really nice card. Thanks for sharing on Jen's hop. I like the way she's reaching up to the sun. Great card. This is so cute. I love how you made it like dhe's holding the sun. Beautiful patterned paper. Super sweet! Love the colours and papers you chose to go along with this. Fabby creation I had great fun working with this set - I hope to see EVERYONE buying this and creating beautiful things.. smiles. Like how you made the fairy hold the sun... cute. Such a beautiful card. What a great hop, for a wonderful person!! Hi, I was the lucky winner on your blog, and I am so excited to see what I won, but I haven't received any Info to collect my winnings. Curiosity is killing me. LOL. Can you tell me what I have to do? Thanks a bunch. So, so pretty - love the papers and the coloring is fabulous! Love it, Beautiful colors and the layout is perfect!!! Fab card - such cheerful colours! 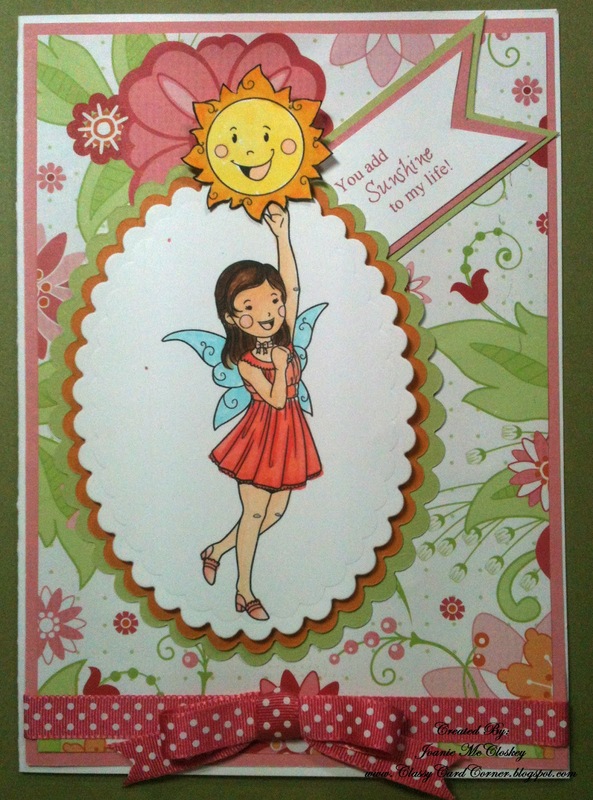 What a bright and cheerful card! A little time to play.... Scrap Happy!! Ever Been On A Farm? ?